– Seb Coe talking about the controversy surrounding the hyperandrogenism issue. The IAAF hopes to have its new regulations (which only affect athletes from the 400m to the mile) in effect on November 1, 2018. 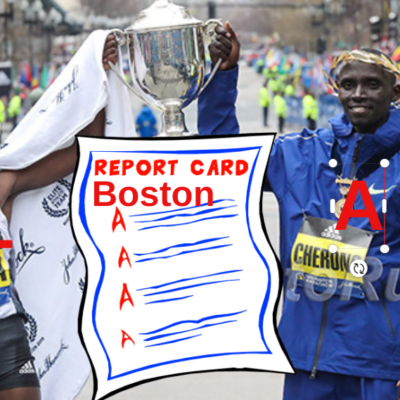 2018 NCAA mile: If Edward Cheserek were racing Kerr this year, who would you pick? Will Elle Purrier win NCAA title #1? Gwen Jorgensen Drinks Red Bull to fuel during races / long runs? what??? Loudoun Valley to try and triple relay at Nationals. What would you do if your 22yo son got on meth and became homeless while your other son was still in HS? 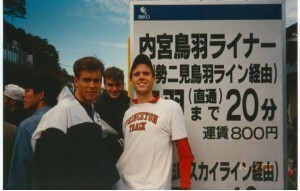 Has any runner set meaningful junior, senior, and masters records? LRC $200,018 Running Warehouse Prediction Contest Get your picks in by 6:30 PM Eastern Friday, get your friends to play as well. LRC DMR Preview: Josh Kerr & New Mexico Are Favored On Men’s Side; Can Elise Cranny Carry Stanford To Title After String Of Near Misses? 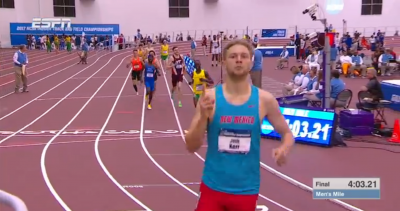 The men’s race could come to an anchor battle of a tired Josh Kerr vs. a fresh Grant Fisher. Who would have the edge? In the women’s race, Stanford and Oregon are our two favorites. 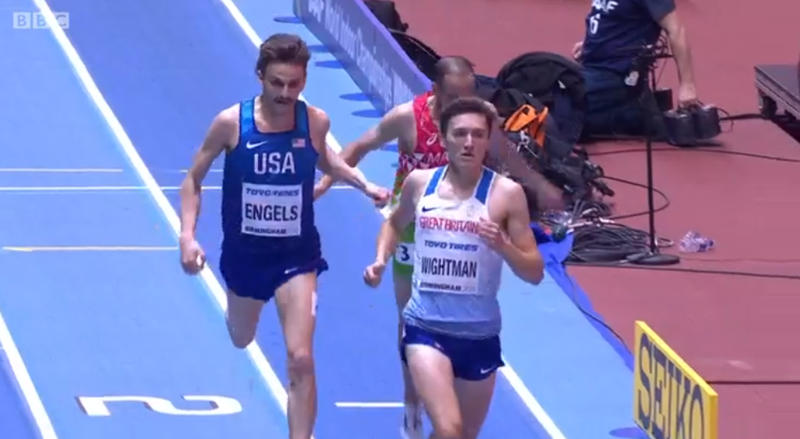 *MB: 2018 NCAA DMR Discussion Thread – Who wins if it comes down to a tired Josh Kerr vs fresh Grant Fisher? Oregon or Stanford? WTF? Former Japan World Championships Marathoner Yumiko Hara Arrested For Shoplifting Candy 36-year-old Hara stole a bag of candy and two other items with a total value of $3.60 from a grocery store. This wasn’t a first offence as she was previously sentenced to a year in prison for shoplifting makeup and food. David Epstein: Magical Mile Was Just One of Sir Roger Bannister’s Myriad Accomplishments Epstein returns to his former employer Sports Illustrated to write about Sir Roger. Malcolm Gladwell: The Ordinary Greatness Of Roger Bannister The New Yorker piece uses a recent thread on our world-famous message board to explain to non-runners how common 4-minute miles are nowadays. Frank Litsky: Roger Bannister, First Athlete To Break The 4-Minute Mile, Dies At 88 The NY Times obit has a great quote from Seb Coe. 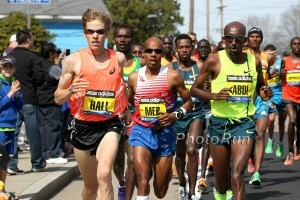 Want More On Bannister? Watch Bannister: Everest On The Track The film was produced by LRC friend and athlete agent Tom Ratcliffe. 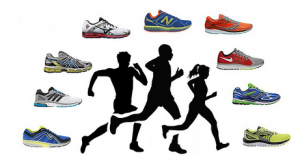 LRC Check Your Running Warehouse Prediction Scores Hopefully you weren’t bragging too much about winning your group last night as there was an error in the women’s 1,500 scores which has been corrected. 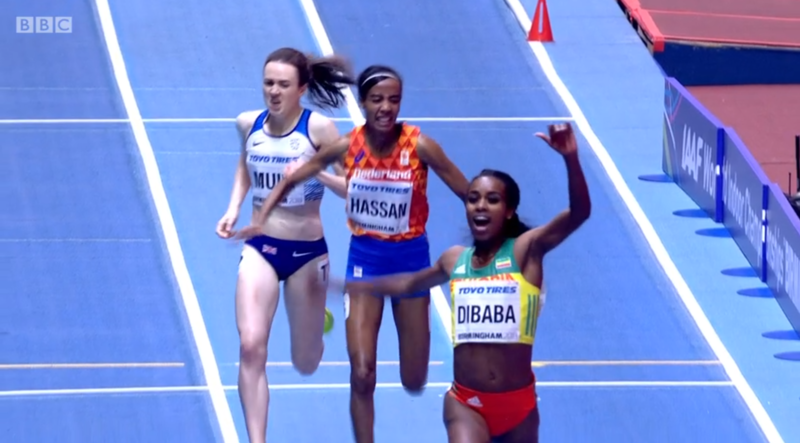 LRC Final Ajee Wilson Puts Up A Strong Fight, But Francine Niyonsaba Remains Perfect Indoors At 800 Wilson ran a great race tactically but Niyonsaba is at another level still. 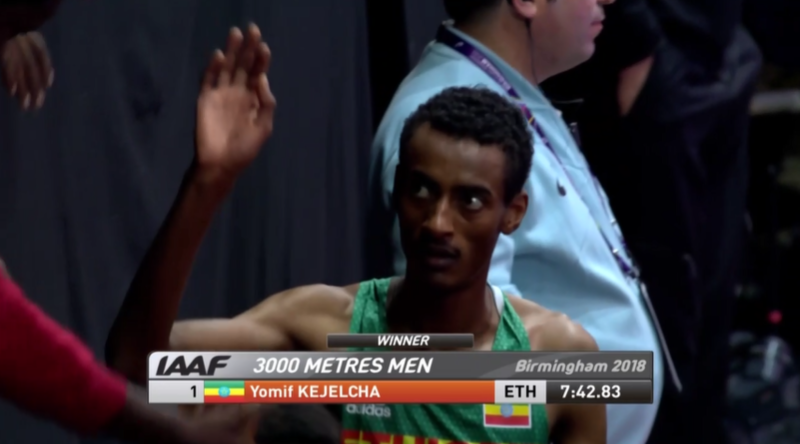 LRC Final Yomif Kejelcha Defends His 3,000m World Title With Ease He crushed the field the final lap as season #1 as NOP ends on a high. 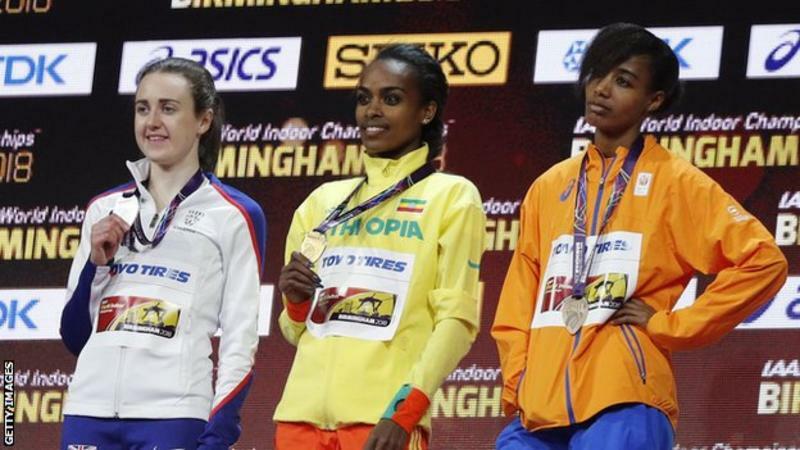 LRC Final Young Ethiopian Samuel Tefera Wins 1,500m Gold 36 Days After His First Indoor Race, Blankenship 5th, Engels 7th Could Tefera be the first Ethiopian 1,500 star? LRC How Four Polish Guys Beat The US To Break The 4 X 400 World Record (3:01.77) This isn’t some April Fools prank. MPV: Renaud Lavillenie Wins Pole Vault Battle With Sam Kendricks And Poland’s Piotr Lisek Lavillenie cleared 5.90m to Kendricks’ and Lisek’s 5.85m. It was a deep competition as seven athletes (including HSer Armand Duplantis who was 7th) attempted 5.90m. W4 x 400: IAAF: Team USA Women Run 4 X 400 Meet Record 3:23.85 To Win World Indoor Gold It was a third-straight World Indoor victory for the USA women’s 4 x 400. 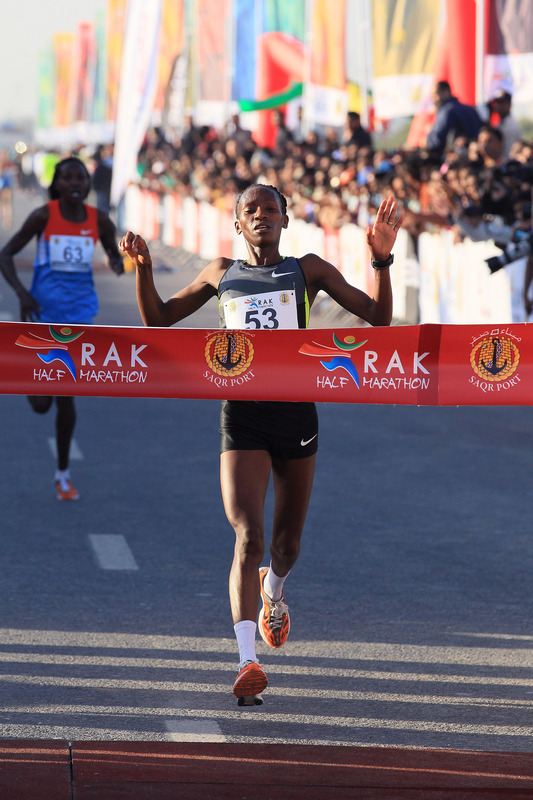 Japan: Ryuya Kajitani Wins Japan National University Men’s Half Marathon In 63:20 Elsewhere in Japan, Kenyan Patrick Muendo Mwaka won the Tamana Half in 62:52 (Yuki Kawauchi was 12th in 64:49). LRC Women’s 800 Semis: The World’s Fastest Woman And Margaret Wambui Go Home As Ajee Wilson Cruises Ajee Wilson was masterclass but Francine Niyonsaba looked fantastic as well in her first race of the year. Raevyn Rogers snuck into the final after Wambui was DQed. 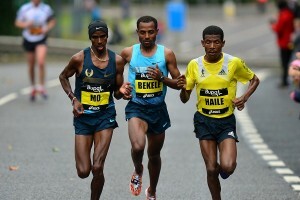 LRC Men’s 1,500 Semis: Americans Craig Engels And Ben Blankenship Both Advance As Tefera And Iguider Stamp Themselves As Favorites For Gold Two Brits, two Americans and two Ethiopians are in the final but Ryan Gregson was eliminated after getting an unlucky heat draw. 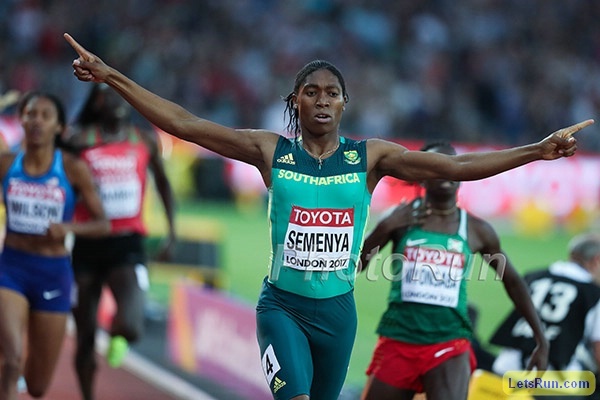 IAAF Agree To New Stricter Rules For Transfer Of Allegiances And Give An Update On The Hyperandrogenism Issue To transfer countries will now require a three-year waiting period, a 20-year-old age limit and can only be done once. On hyperandrogenism, the IAAF hopes their new rules (only affecting events 400m to the mile) will take effect on November 1, 2018. *Athletics Weekly Article/Analysis On IAAF Council Meeting The IAAF also set a global calendar for championship events. 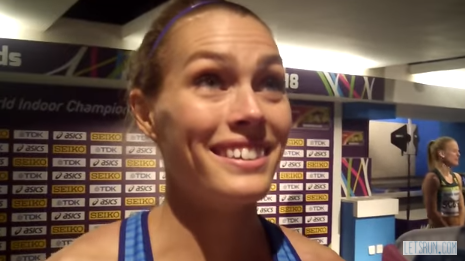 What the D**Q happened at the World Indoors? IAAF Adopting A New World Ranking System Like They Use In Tennis Or Golf Ratings will be averaged out based on an athlete’s weighted best five performances over the last 12 months and will affect qualification for championship events. Slovenian High Jump Record Holder Rozle Prezelj Named Seb Coe’s Advisor Prezelj has just finished his term as head of the IAAF Athletes’ Commission. Canada Former Race Walker Iñaki Gomez Elected Chair OF IAAF Athletes’ Commission Valerie Adams was named the vice-chair. IAAF Extends Russian Ban, Warns Neutral Athletes Could Lose Permission To Compete “If Progress Is Not Made” Russia could even be expelled from the IAAF as they still haven’t met multiple conditions such as a plan “that shows an adequate amount of testing” and fixing legal issues which prevent coaches from being provisionally banned. Kudos: Netflix Sports Film “Icarus” Wins Oscar For Best Documentary The documentary by Bryan Fogel is on the Russian doping scandal and focuses on whistleblower Grigory Rodchenkov. InsideTheGames Article With Quotes From Rune Andersen And Seb Coe RUSADA also hasn’t identified athletes who provided samples that showed up positive in the Moscow Law system data. Vladimir Putin Thanked The Russian Ice Hockey Players For Singing The Russian National Anthem After Their 2018 Winter Olympic Gold The anthem was supposed to be banned as they were there as “neutrals.” Do you think the IOC took any action? No, they reinstated Russia. The Russian Olympic Ban Was Lifted By IOC Immediately Following The 2018 Winter Games A short mostly inconsequential “ban” that let’s the IOC pretend they are doing something. German Lawyer Representing Banned Russians Claims 2018 Olympic Medalists Do Not Have A “Complete Triumph” With The Absence Of Some Leading Russians He has a point, having to beat out Russian dopers is something of a rite of passage for Winter Olympic medalists. University Of Nevada-Las Vegas Women’s Track Team Has Their Vans Robbed During A Road Trip In New Mexico Despite having all their belongings and equipment stolen, the team still won the Mountain West Championships, their first indoor title since 1993. Oregon Ducks Go To NCAA Indoors With Lowered Expectations The men’s team ranked 16th, the women’s team is 7th. Robert Johnson says he thinks if the women are “perfect” they could score 40 points and that might win the meet. 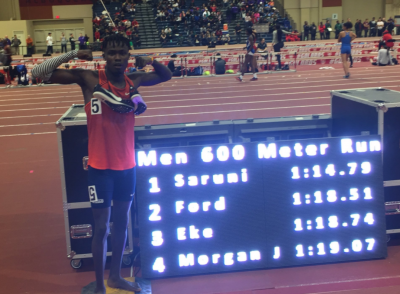 USTFCCCA Takes A Look At The Biggest One-Meet Scorers At An NCAA Indoor Championships Edward Cheserek holds the men’s record with 28 points in a single meet (2017) and also has the career scoring record with 91 points. Former Texas athlete Carlette Guidry has the overall meet record with 30.5 points from 1988. Pre-Championship Men’s NCAA Rankings: Texas Tech Remains #1 Georgia moved up from 5th to 2nd and Florida down from 2nd to 3rd. 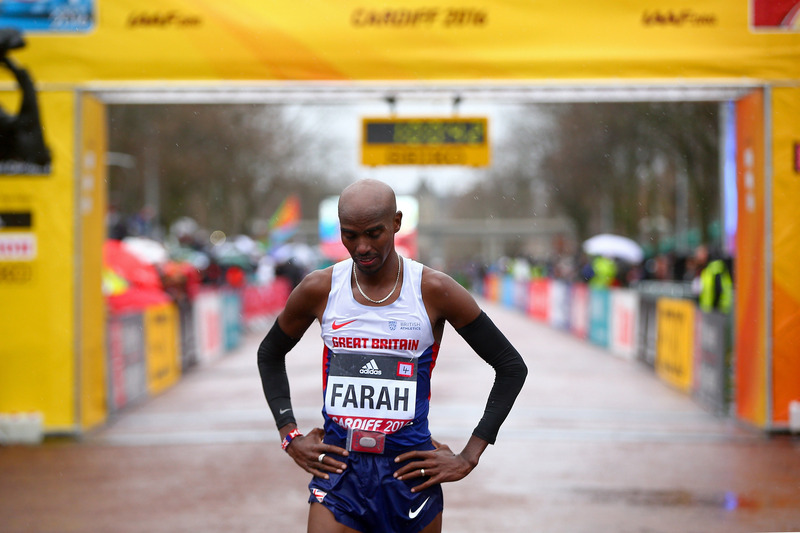 UK Parliamentary Inquiry Wants L-Carnitine Injection Given To Mo Farah Investigated By General Medical Council The committee said they were “shocked to hear” that the chief UKA medical officer gave an injection he had never given without recording the dose in Farah’s records. Seb Coe Accused By UK Parliamentary Inquiry Of Giving “Misleading” Answers Over Russian Doping Allegations They allege that Coe was dishonest when he claimed he was “not aware” of the Russian doping allegations before the ARD documentary in December 2014 as he had received an email from David Bedford that August. Sources Say Olympic Steeplechase Champ And World Record Holder Ruth Jebet Has Failed A Drug Test There is no official confirmation, but The Guardian writes that “a number of prominent sources” have reported Jebet tested positive for EPO. 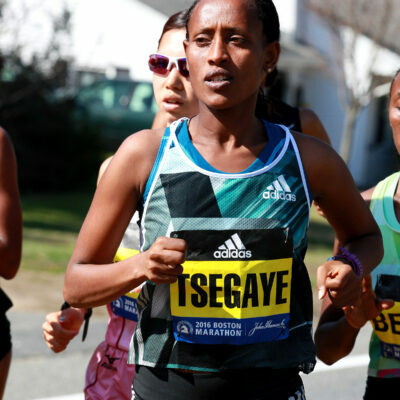 *MB: RUTH JEBET EMBROILED IN DRUG SCANDAL!!! DQ Drama LRC Men’s 800: Poland’s Adam Kszczot Wins Much-Deserved Gold As Drew Windle Snags Silver Initially there was elation for the Brooks Beasts Drew Windle, then despair as he was DQed, and then elation again. 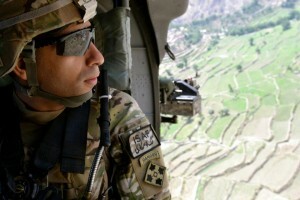 *MB: Officials change their mind. Drew Windle’s DQ is lifted. He’s won silver!! What A Night For Team USA LRC Best Of The Mixed Zone: Christian Coleman’s Call From Maurice Greene, Will Claye May Skip Outdoors To Promote His Album, & Michael Cherry’s Unorthodox Medal-Winning Meal It was an incredible night for Team USA at World Indoors as it won 5 gold medals – m60, w60H, w400, mTJ and wPV – and set three new championship records in the process. We talked to all the gold medal winners and share the highlights. 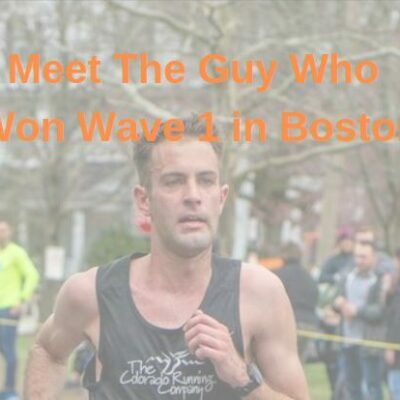 Find out which winner won after practicing only once all winter. 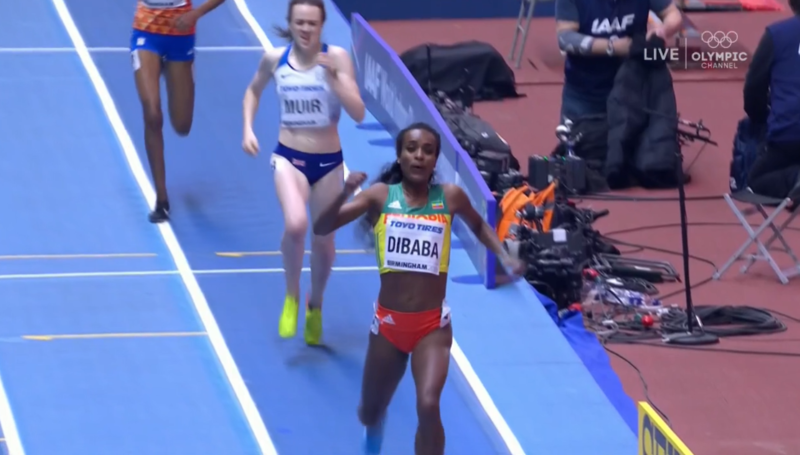 LRC Women’s 1,500: Genzebe Dibaba Remains Unbeatable Indoors, Muir 2nd And Hassan 3rd Dibaba was sensational once again over the last 1k – nearly beating the indoor 1k world record en route to her fifth indoor gold. IAAF Recaps: Friday Night Was Incredible For Team USA As It Won 5 Gold Medals The US picked up golds in the m60, w60H, w400, mTJ and wPV. Men’s 400m final: DQ Police Win Again And DQ Top Two Finishers After that happened, Pavel Maslak was elevated from bronze to a 3-time champ. W400: Courtney Okolo Crushes The Field As US Goes 1-2 Shakima Wimbley was the best of the rest but Okolo nearly won by a full second. Heptathlon: France’s Kevin Mayer Wins Heptathlon IN Thrilling Fashion – By Just 5 Points The 1,000 was legendary. 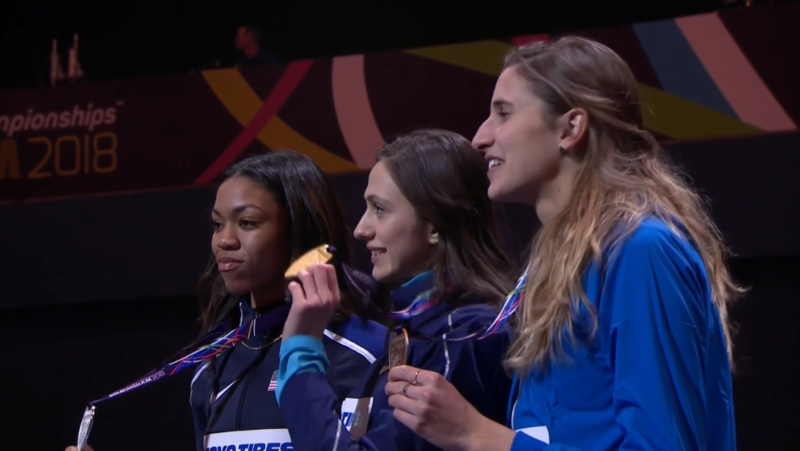 WTJ: Venezuela’s Yulima Rojas Defends Her World Indoor Triple Jump Title With 14.63m Despite Not Having Competed Since August USA’s world leader Keturah Orji only managed 5th. Men’s Updated Bowerman Watch List Distance runners on the current list are Josh Kerr, Justyn Knight and Michael Saruni. The Bowerman: 2018 Women’s Pre-NCAA Indoor Watch List Karissa Schweizer and Elinor Purrier represent the distance events. Spain’s Oscar Husillos Found Out He Went From 400m Gold To DQed During A TV Interview The interview is in Spanish, but you can see his demeanor change dramatically at the 1:07 mark when he finds out. AP: Laura Muir Goes From The Podium To The Abattoir This Week An abattoir is a slaughterhouse. Past Bowerman Award Winners Shined At World Indoors Bowerman winners got two golds in Christian Coleman and Courtney Okolo. Team USA Superlatives At World Indoors There was only one American record, but Team USA set four championship records. 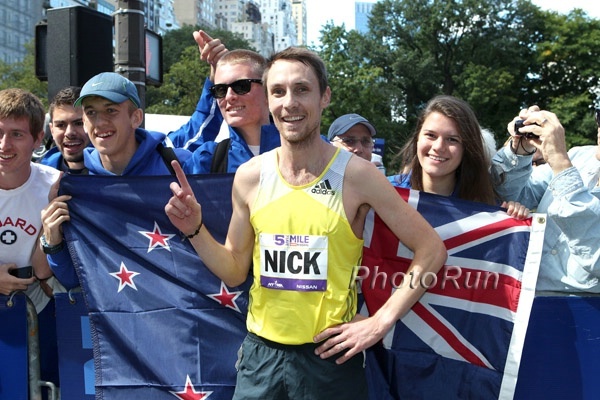 Bummer: Nick Willis Ruled Out Of Commonwealth Games After Failing To Recover From Recent Stress Reaction In His Fibula He says his leg hasn’t even healed enough to start training again. How Much Tax Will Japan’s 2:06:11 Man Yuta Shitara Have To Pay On His 100 Million Yen National Record Bonus? After taxes, Shitara’s 1 million yen ($946,000) gets reduced down to 72,637,500 yen (~$687,000). RIP: Running Legend Roger Bannister Dies At Age 88 The first man to break the mythical 4-minute barrier in the mile has died peacefully in his sleep. Pay your respects here. Athletics Weekly Tribute To Roger Bannister Bannister was famous for more than his sub-4 as he also was a distinguished neurologist and he considered his medical achievements superior to his sporting success. 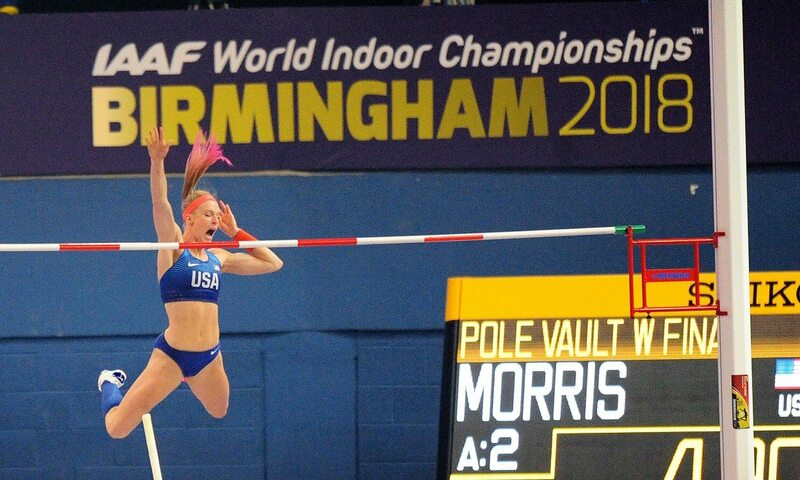 Athletics Weekly: Sandi Morris Breaks “Silver Streak” With World Indoor Gold Morris broke the “silver Sandi” streak as well as Katerina Stefanidi‘s 19 meet winning streak. *The Independent: Johnson-Thompson Now Wants A Golden Hat Trick In 2018 She has one gold down with Euro Champs and Commonwealth Games to go. Sally Pearson Not Making 60H Final Tops Disappointing Meet For Australians Ryan Gregson (1,500) and Michelle Jenneke (60H) also failed to make it out of the rounds. 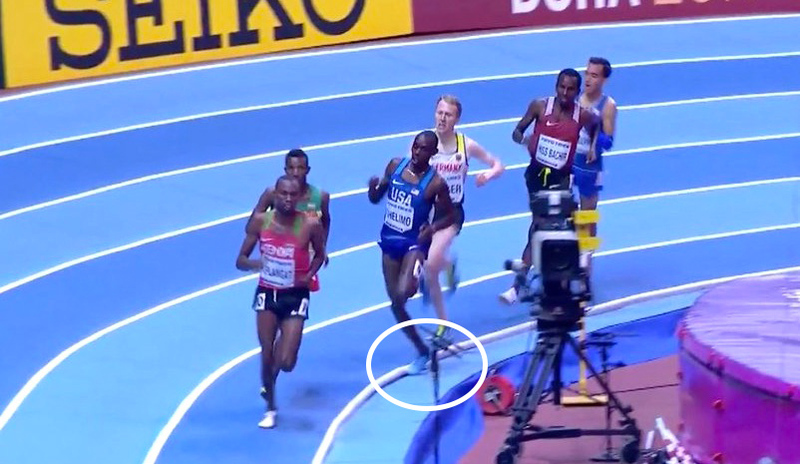 FloTrack Asks If The British Officials Are Playing Favorites At World Indoors They compare a video of Chelimo’s DQ to one of Mo Farah at Worlds last year where he wasn’t DQed.